Browse through our online selection of vintage and contemporary American and European art pottery and prints. 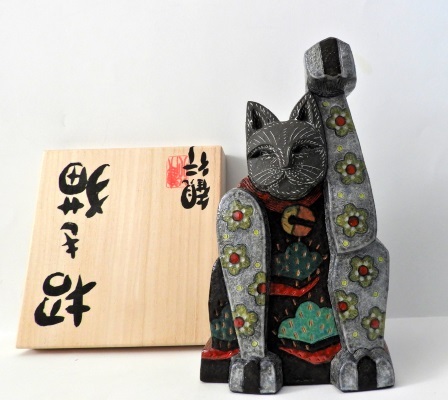 Our inventory is divided into five easy to use categories: American Art Pottery, European Art Pottery and Glass, Decorative Objects, Japanese Woodblock Prints, and Japanese Pottery. Just click on the category you want to explore in the left hand column and our current inventory will be displayed. You can always request additional pictures. If you have questions, have pottery you wish to sell, or would like to be on our mailing list you can reach us at susan@tojgallery.com or by calling 410-626-0770. YOU CAN ALSO FIND US ON INCOLLECT. CATCH THE BIDSQUARE BLOG ON THE NEW YORK CERAMICS AND GLASS FAIR. Monumental 17" Korean Moon jar by Anglo-Japanese ceramic artist, Akiko Hirai. Hirai's Moon jars were recently exhibited by the Royal Academy of Arts. In excellent condition.
" Daisen in Garden" by Hodaka Yoshida, 1953. Hodaka(1926-1995) was the son of Hiroshi Yoshida and the brother of Toshi. 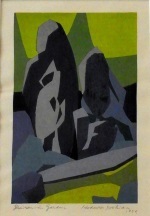 He began as an oil painter but switched to woodblock prints in 1950. 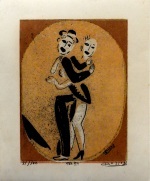 Our self published print is in excellent condition and the framed size is 13.5" by 16.5"
Intaglio etching, "Comedy" by Hosoya Masayuki from the circus series,11/23. Printed on washi paper, the framed print measures 17.25" by 22". In excellent condition. 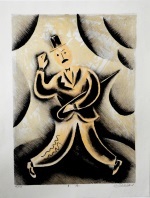 New to TOJ Gallery is the work of Hosoya Masayuki. Our etching on thin washi paper is titled, "A Slight Fever", 51/100. Born in 1943, Hosoya Masayuki trained in France at the Cherbourg Art School and in Tokyo at Ochaomizu Art School. His prints are a unique blend of western abstraction and Japanese printing on thin washi paper. Our etching is in excellent condition. The framed size is 15.5" by 14". Stunning and monumental in design is this 38" W wood fired wild clay wedge shaped vessel by Josh Copus. The vessel is wheel thrown and paddle shaped with finger wipe decoration. Wild clay is clay that Josh forages locally. In excellent condition. Josh is represented in the permanent collection of the Mint Museum. 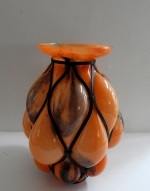 Fabulous 10.5" handblown glass vase commonly referred to as verre en forge by Kralik, Czechoslovakia, circa 1920s -1930s. In excellent condition. New at TOJ Gallery an L & V Ceram art deco faience craquelure figure of an elephant and trainer, circa 1930. The sculpture is in excellent condtion and measures 17"L by 4"W and 10.5"H.